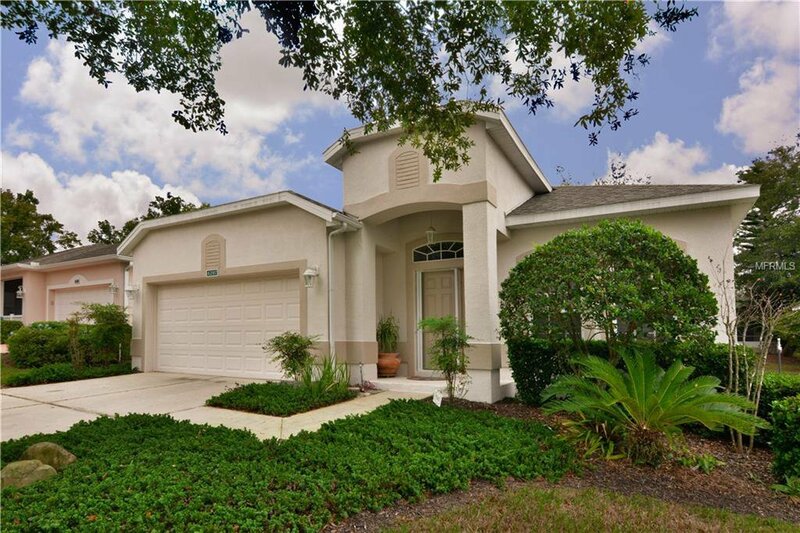 Charming 3BR home in Kings Ridge, one of Florida’s premier 55+ communities. You’ll be impressed from the moment you arrive – guard-gated community with attractive landscaping at every turn. Here you’ll enjoy having your home’s exterior (landscaping/paint) maintained by the community association. This home’s layout includes open and versatile space upon entry that’s designed as a living/dining area but is versatile to arrange as you see fit. The heart of the home boasts a spacious family room that’s open to the kitchen. Kitchen features an over-sized island that has an expanded breakfast bar, closet pantry, and access to the screened lanai. Split bedroom plan with master suite in the back of the home. Generous sized bedroom w/direct lanai access, walk-in closet and en suite contemporary bath. You’ll appreciate the interior laundry room w/extra cabinetry! The main reason you’ll want to own this home-all the amenities offered. Huge clubhouse with coffee bar, fitness classes, many clubs for all sorts of hobbies and activities to keep you busy. A full-time activity director helps organize day trips, cruises and more. Outdoor activities include the availability of all sorts of ball courts and the enjoyment of a resort style pool. Consider a golf membership as there are two courses rolling through the community. Excellent location – short drive to essential shopping and dining, SR 27, SR 50 and the Florida turnpike. You’ll love living here. Come see all that this special home has to offer. Listing courtesy of KELLER WILLIAMS CLASSIC REALTY. Selling Office: COLDWELL BANKER RESIDENTIAL RE.